I’ve never been crazy about running. I only got into jogging when I was living in Prague because it seemed like the best way to enjoy the gorgeous scenery along the Vltava River while burning fat. Unfortunately, I was a heel-striker and ran up one too many cobblestone steps. I developed plantar fasciitis about 6 months later and was advised to take a break from running by my physio friends. I surprised even myself when I agreed to do the 2015 Genghis Khan Extreme Marathon with L over a mutual friend’s birthday dinner in mid May. Perhaps I agreed so readily because I didn’t think it was physically still possible to register for the race. I’ve heard from friends who’s done it in the past that the race was often booked out months in advance, and that included air tickets and hotels at the race location, Xiwuqi. So I wasn’t at all surprised to read on the website that the race has been fully booked and my only option was to go on the waiting list and wait for last-minute cancellations. I did just that and promptly forgot all about it. Imagine my surprise when I received an email from the organisers in early June, informing me some spots had come up. After some initial difficulties working the online registration system, L and I managed to register for the half-marathon. Considering there’ll be 1800 participants and their families descending upon this small Inner Mongolian town for the weekend, we felt incredibly blessed we were still able to book discounted air tickets and hotel accommodation with less than a month to go. As part of training to do a triathlon in the not-too-distant future, I’ve been jogging between five and ten km once or twice a week since mid March. I didn’t think this was adequate training do a half-marathon with uphill trails, and knew I’d probably walk half the time. On the actual day, L’s and my Vibram Five Fingers attracted the attention of quite a few fellow runners, who commented we were brave (read: stupid) to be running a half-marathon almost barefoot. I’ve found running short distances in my Vibram Five Fingers for the last six months quite comfortable as they’ve fixed my heel-striking issue and didn’t see why I should get another pair of running shoes, especially since we’ll be running mostly on a grassland trail. I couldn’t have picked a better place to run my first half-marathon. We started at 7 am when it was a cool 18 degrees and ran into the rolling grassland, which looked like it’d never end. Unlike the full marathon trail, the half-marathon trail didn’t bring the runners close to grazing cattle and the galloping horses. But I already felt contented to be running under the azure blue sky and cottony clouds with runners from China, Mongolia and all over the world. I did end up walking up the uphill trails and about 5-6 km towards the end because I felt too sore to run on the uneven ground. The organisers made sure we were hydrated and fed with water and snack stations situated every five km of the trail. I finished my first half-marathon in 3:25:37, nine minutes behind L who runs regularly. I was so happy to complete it, I didn’t care about my time. But I was pleasantly surprised I wasn’t the last to finish. 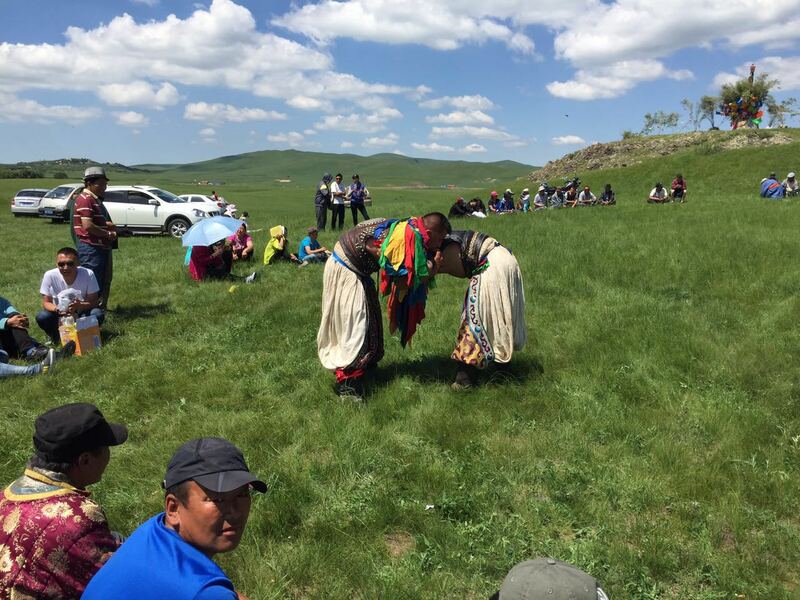 It was a treat to watch a Mongolian wrestling match and take part in the celebration feast of lamb and horse intestines in the Hills of Siriguleng and Halagatu. After finishing the half-marathon, L and I got down to the most important part of our trip — sightseeing. Xiwuqi, being deep in the heartland of Inner Mongolia, was an ideal place to witness the traditional Mongolian herding lifestyle, experience local culture and eat lots of delicious lamb dishes. 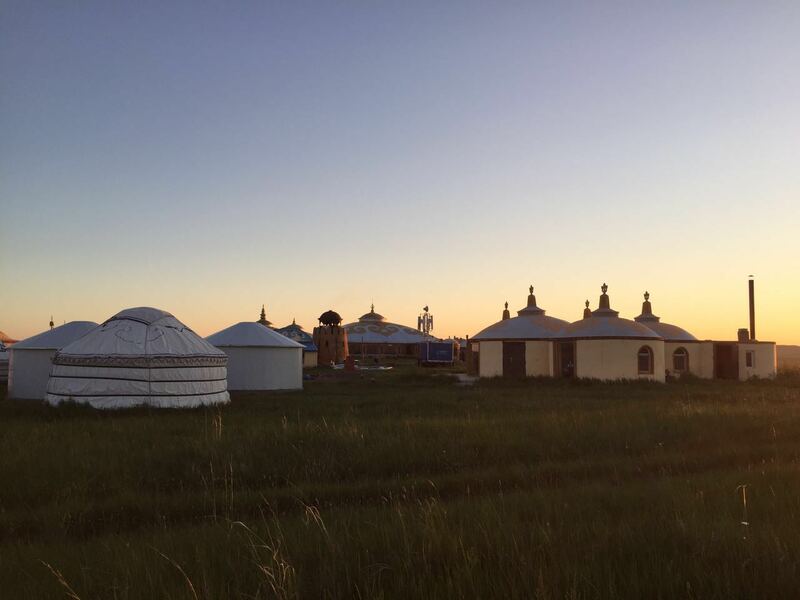 After spending a night in a Mongolian yurt in Mongolian Khan City, we hired the Mongolian owner of the convenience store to show us the sights, which turned out to be an ingenious move as evidenced by the pictures in this post and on my Facebook. Our Mongolian driver explained and showed us how the locals lived on and by the land and believed as they were blessed abundantly by their animals and nature, it is only right to give back by using their resources responsibly with a long-term view to sustainability. I left Xiwuqi feeling there’s still much to learn from my newfound Mongolian friends. Registration for next year’s Genghis Khan Extreme Marathon is rumoured to start in August. If you’re planning on doing either the MTB or marathon or both, make sure you register early so you don’t miss out.